The Leisure Series trash can maintains high quality at an economical price by having slightly less steel around the bottom and top edges and larger expanded steel diamond-shaped openings. 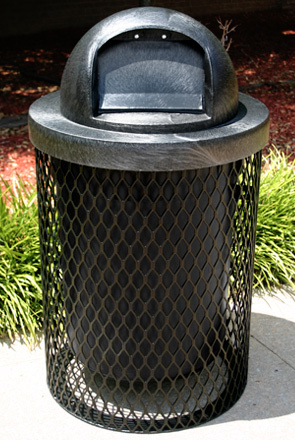 These thermoplastic coated outdoor trash cans are available in all the same lightly textured matte Polyethylene color options as our matching thermoplastic coated tables and benches. These rugged expanded steel receptacles will take years of abuse while maintaining an attractive, matte finish. Receptacle tops are offered in plastic dome top, steel dome top, and flat top styles. The welded steel frame is also available in your choice of colors. Steel top covers are available in all Polyethylene colors. Plastic dome top covers are available in the colors shown below. 1-1/2" # 9 Gauge Expanded Metal. 32 Gallon Plastic Liner & Lid Sold Separately.